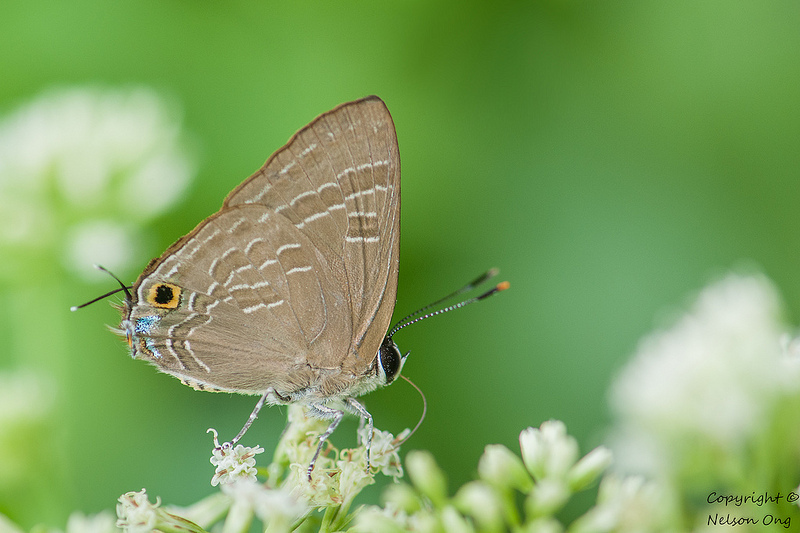 This robust-bodied Lycaenid is one of two species from the genus Deudorix that can be found in Singapore. It is observed at urban parks, as well as in the forested nature reserves, usually feeding at flowers. In this shot taken last weekend, ButterflyCircle member Nelson Ong encountered the Cornelian feeding at the flowers of the Mile-A-Minute (Mikania micrantha) weed. The upperside of the males of this species features crimson wings with broad black borders, whilst the females are a drab copper brown. Caterpillars of the Cornelian have been recorded to feed on pulpy fruits like the Lychee and Pomegranate. More details about this butterfly can be found in an earlier article on this blog here.